NEW DELHI: Bangladesh Prime Minister Sheikh Hasina and her Indian counterpart Narendra Modi are scheduled to inaugurate the Bangladesh Bhaban on the Visva-Bharati University campus in Kolkata late this month. Diplomatic sources said the date for the inauguration of the Bangladesh Bhaban is yet to be fixed, but, according to them, both the premiers have agreed to open the building in a ceremony. The date may fall on May 25 or May 26, the sources said. West Bengal Chief Minister Mamata Banerjee will remain present at the function. The sources said the ceremony will pave the way for another meeting between the two premiers of the two next-door neighbours. 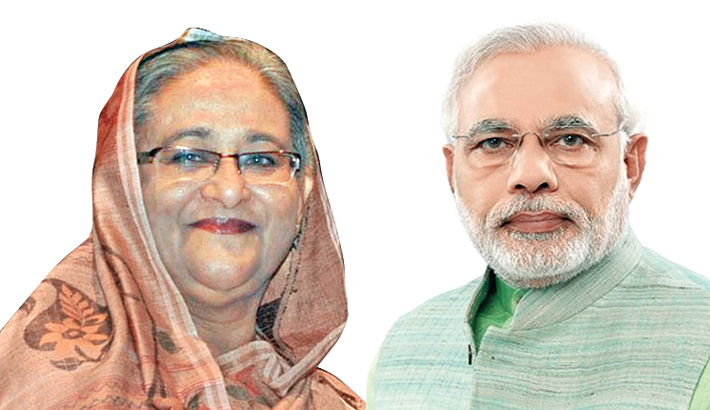 As Teesta deal and other important issues between the two countries have remained unsettled, Hasina and Modi sat for a meeting on April 19 on the sidelines of the commonwealth summit of heads of government in London. The Viswa-Bharati University authorities allotted a piece of land to Bangladesh for the construction of the proposed ‘Bangladesh Bhaban’ near the Indira Gandhi Centre. The two-storey building, which has housed a museum showcasing Rabindranath Tagore’s association with Bangladesh, freedom fighters and Indo-Bangla relations, has been built on 7,000sf land with the financial support from the government of Bangladesh. Rabindranath Tagore is a bond in between the people of India and Bangladesh. About Tk 25 crore has been spent to construct the building, which will be the focal point for scholars involved in research and studies related to Bangladesh. Some portions of the building will also be dedicated to Bangabandhu Sheikh Mujibur Rahman. The Indian government allotted the land during Sheikh Hasina’s visit to India in 2010. Narendra Modi also spoke on a probable meeting with Sheikh Hasina during his meeting with Awami League general secretary Obaidul Quader-led delegation in New Delhi. The AL delegation visited India from April 22 to April 24 at the invitation of the ruling Bharatiya Janata Party. Mamata Banerjee has recently visited New Delhi to attend a meeting on the birth centenary celebration of Mahatma Gandhi. Modi discussed the issue with her. Bangladesh Cultural Affairs Minister Asaduzzaman Noor has recently visited India and held meetings with the university authorities, expressing the hope that both the premiers will inaugurate the Bangladesh Bhaban. “We want this Bhavan inaugurated by the end of May. We are told that the Indian prime minister will come soon to Viswa-Bharati for its convocation. We want to time the inauguration programme accordingly so that we can have the two prime ministers there,” Noor said. “It will be a matter of great significance if the prime ministers of both the countries attend the inaugural function,” he said.